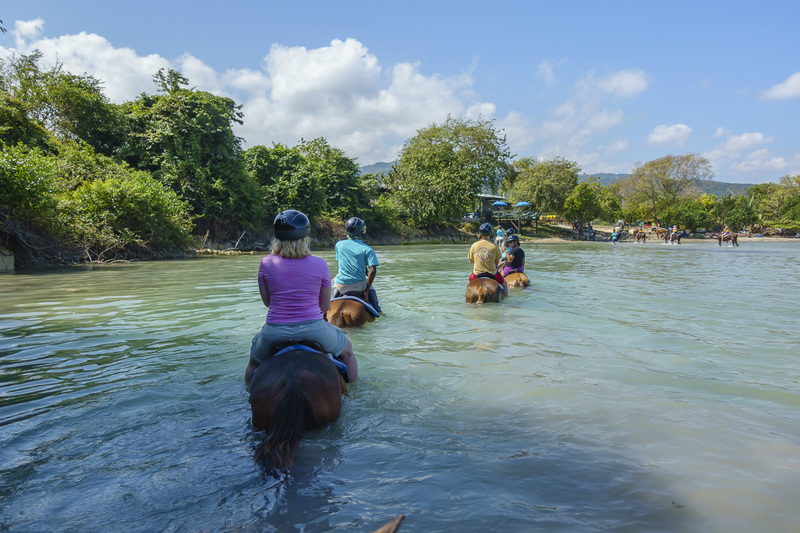 Swimming with horses in Jamaica fulfills many bucket list fantasies of honeymooners and vacationing couples! 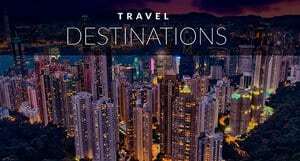 It's the ultimate romantic excursion for couples visiting the Caribbean Islands. 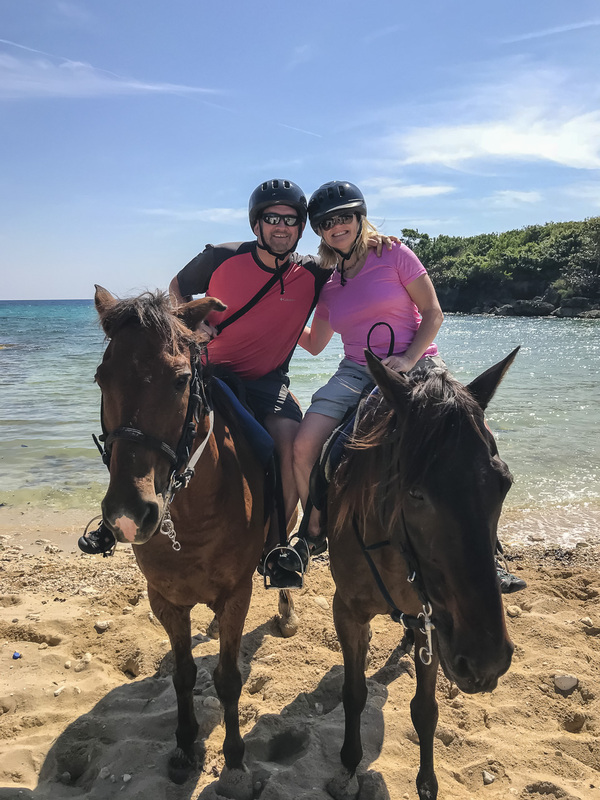 We've taken many horse treks and trail rides during our travels, but when Visit Jamaica asked us if we'd like to swim with horses in Montego Bay, I'll admit, I had my reservations. Do horses like swimming? Is it just a gimmick? Would I be in the water with dozens of other people wanting to fulfill one of their romantic dreams? It turns out, swimming with horses is a lot of fun. BOOK YOUR SWIM WITH THE HORSES NOW FROM $79! Do Horses Like to Swim? First of all, let me tell you a little about swimming with horses. Chukka Tours take great care in keeping their horses healthy and happy. Our guide Carrey told us that horses in Jamaica only go out on one trail ride a day and get to relax and graze the rest of the day. We were told that horses really like going in the water and appreciate cooling off in the water after a hot day in the sun. When I looked this up, it seemed that most horses feel the same way. Most horses are strong swimmers and can handle themselves in the water. Only horses that want to swim in the ocean do so. If a horse doesn't want to go, it is not forced. The ride is only 10 - 15 minutes long and it switches off with walking in deep water to short bursts of swimming. Therefore the horses are not overworked or in danger of getting tired. Is Swimming with Horses Safe? 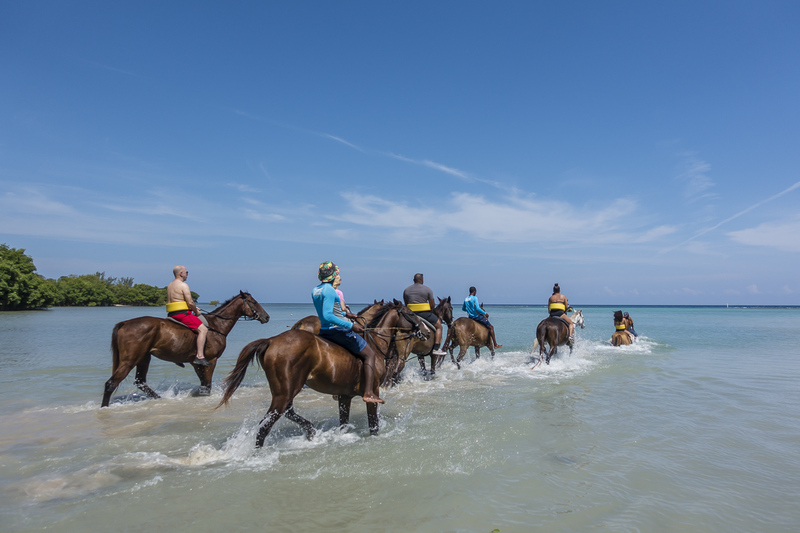 Different horses are used for swimming than the trail ride. Time for the trail ride before swimming with horses. 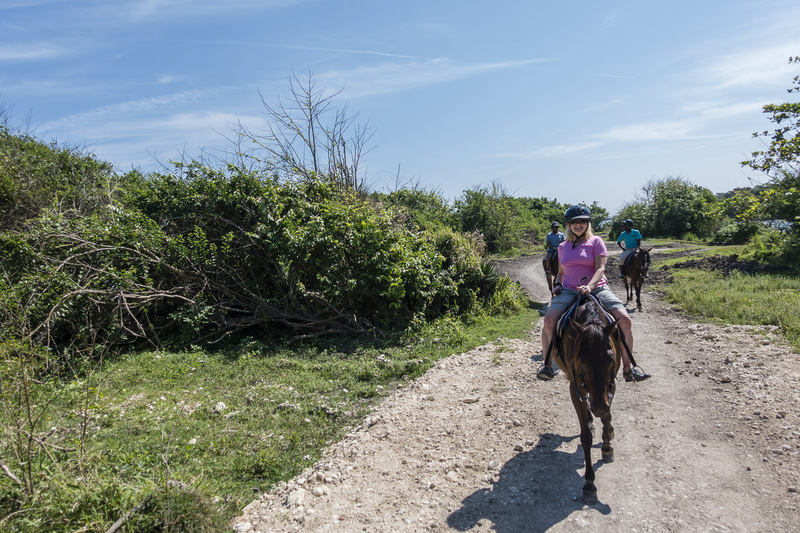 The tour starts off with a 30-45 minute trail ride on one set of horses and then they change horses for the swimming. 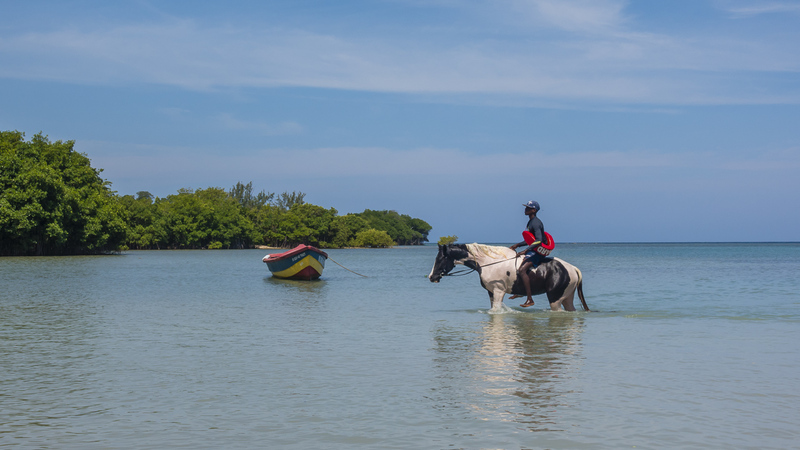 As our Chukka guide said to us, "If the horse doesn't want to go in the water, it won't do it." And I believe him. 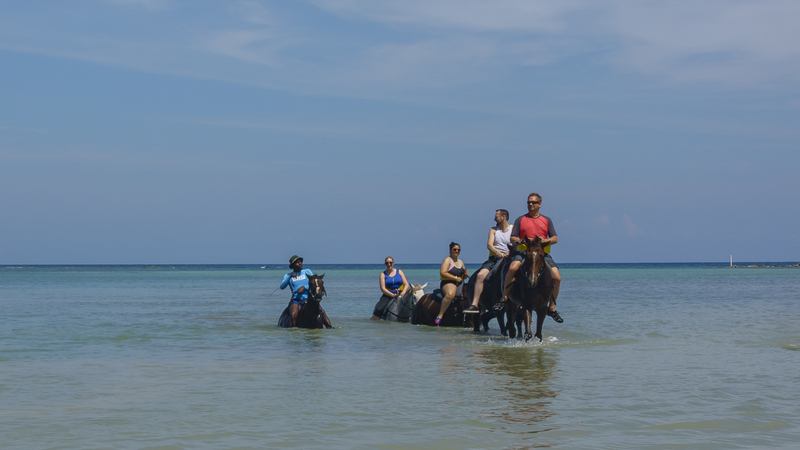 The last thing any tour company would want is for a horse to panic while swimming and harm a tourist in the process. When swimming, horses need to be relaxed and if they were afraid or unhappy in the water, they would panic or act up. Swimming horses make a wired sound. I was worried that they were labored with their breathing, but I read it is normal. Our guide said it had something to do with the salt water. Either way, it's just the way horses breath when they are in the water and nothing to worry about. Just be prepared for a louder horse than usual. What I like about Chukka is that all the riders wore floatation belts. I think safety is very important when you do a group ride and the belts offer a safe environment for the rider and the horse. 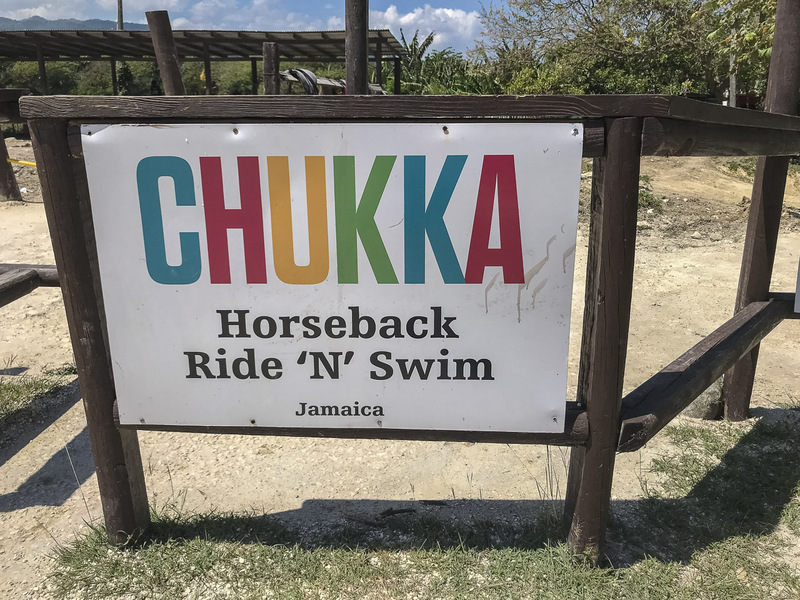 We were picked up at our hotel, The Hyatt Zilara, Rose Hall in Montego Bay for an hour-long minute drive to Chukka Ride and Swim in Ocho Rios. 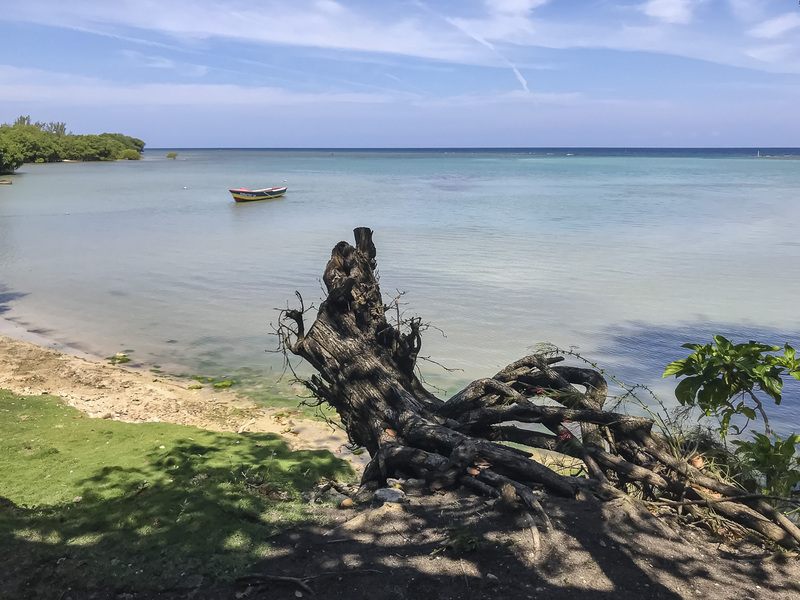 Chukka Cove is located in Llandovery St. Ann, just 15 minutes North of Ocho Rios. 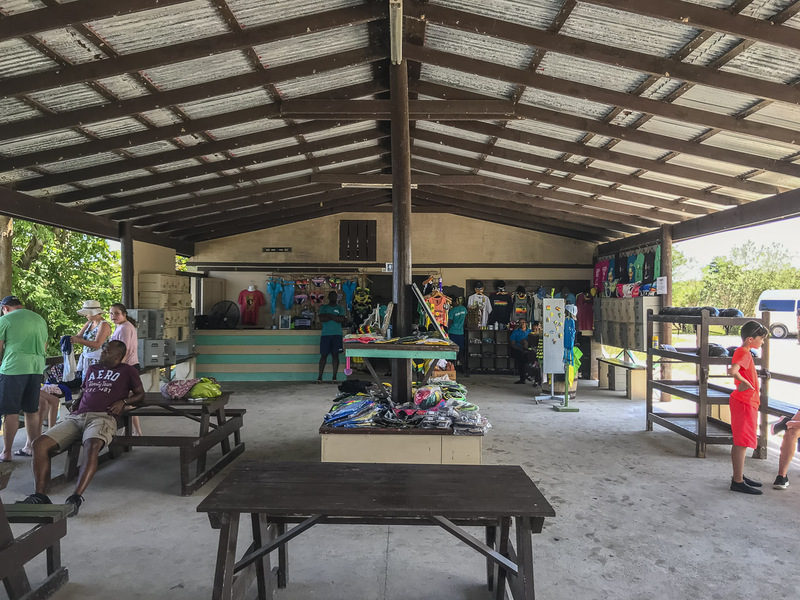 Chukka has other locations in Jamaica including Montego Bay, but we had afternoon plans to visit Green Grotto Caves, which are located between Ocho Rios and Montego Bay so we chose the site further out. 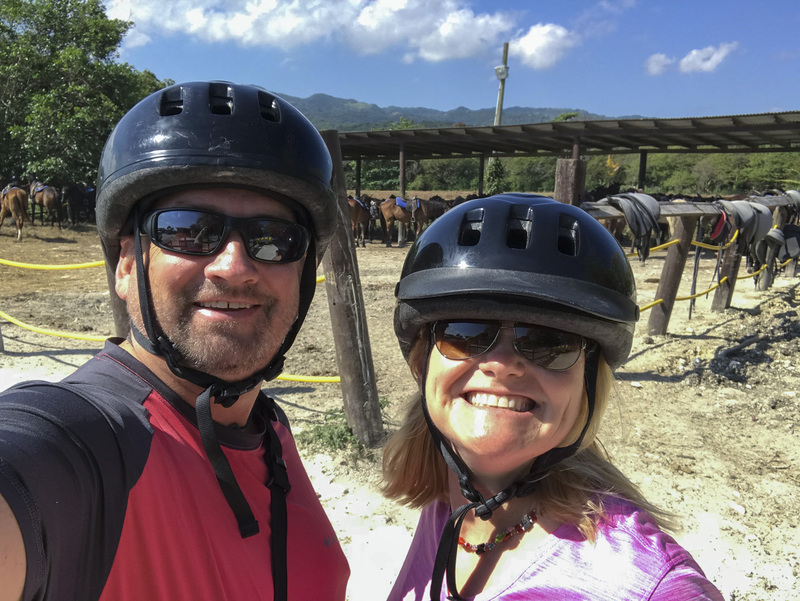 Upon arrival, we grabbed helmets and signed waivers before setting off on a trail ride through farmland towards the beach. Our group consisted of about a dozen people. It felt like a good size for the ride and they kept couples together with their horses. We had heard that some tours can reach up to 40 people. Something tells me that is the cruise groups. 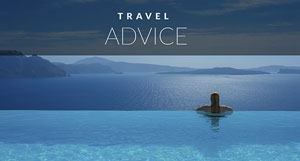 We've noticed from cruises we've taken that tour groups are much larger. You are much better to stay on the island. The first part of the ride was uneventful. We spent the first portion of the trail on a double track and even shared it with ATVers returning from their drive. Our guides were energetic and excited and full of jokes and stories so that made up for the lack of scenery. 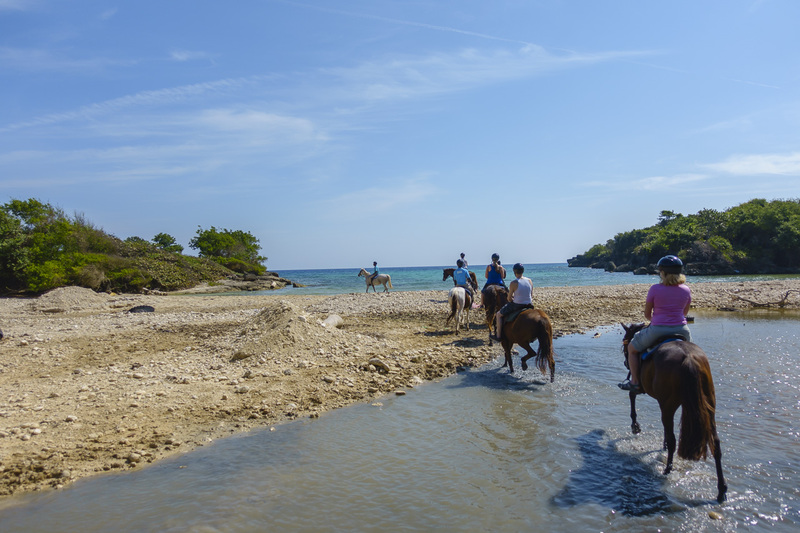 But once we got into the trail, it felt better riding through the forest and coming out at the water for our beach ride. We came out of the trail at a picturesque bay and walked along the beach where we stopped for a photograph while taking in the view. After the mandatory pictures, we turned around to make our way back. 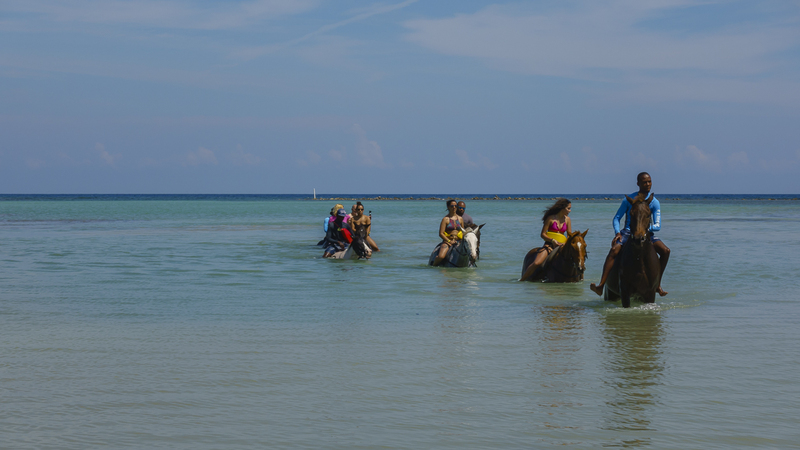 Everyone gets a photo of horseback riding on the beach! But the best part of the trail ride was getting to walk through the woods and do a few pond crossings before going into the ocean. It wasn't time to swim with the horses, but they had a nice little cooling off period in the shade as they walked chest deep in the water. I felt like it was a warm up to our upcoming swim with the horses. 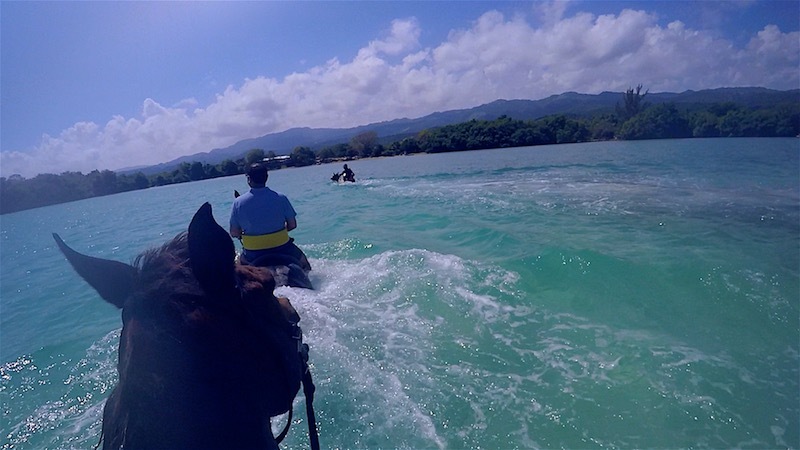 We had the chance to get wet and see what it felt like to walk in deep water while sitting on a horse. The change over from riding horses to swimming with horses was a bit confusing, but it wasn't anything to worry about. There were a lot of different tours going on at once and some people were just arriving, some were leaving, and some were in the middle of the tour waiting to go for a swim - like us! Dave and I were slower than others because we were taking photos and videos and at one point thought we missed the group. But we found a couple that we talked to on the trail and they were still inside as well. 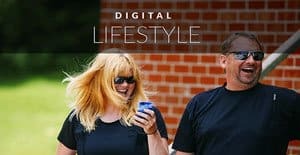 HAVING FUN READING THIS ARTICLE? BOOK YOUR SWIM WITH THE HORSES NOW FROM $79! Before arriving, Dave and I didn't realize that we changed horses. We thought we took a long trail ride overland and then ended in the water. So we didn't bring bathing suits. There was no way I was going to ride for 45 minutes in my swimsuit on a trail in my swimsuit. Can you imagine the chafing? So we both chose to wear quick dry shorts and shirts. Waiting for the swim portion of the activity. It turns out the other riders did their research and knew that we started on land and then changed into swimming. They were ready for the water, but that's okay, other peopel chose to wear t-shirts and shorts too. I ended up feeling good about the decision because when we went swimming, it didn't really matter if I was wearing a bathing suit or not. When the swimming portion started, they took us out in smaller groups so our one large group split into two. It was a pretty laid back experience anyway. We figured if we missed our group we would have been okay. 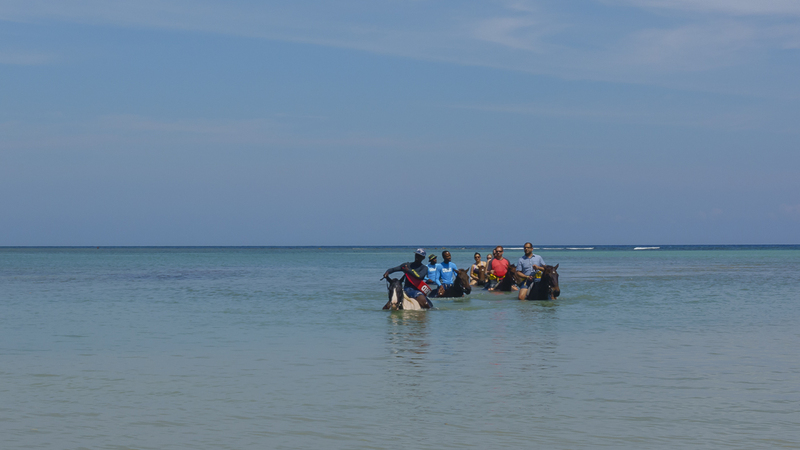 When it came down to going back to the horses and swimming, guides simply asked us if we'd had a chance to swim yet? Waiting to swim with horsesIf we didn't, they put us in with the group about to go in. All was good. Dave and I decided to split up so that we could take photos of each other, but realized it was a bad idea. The horses go pretty far out from the beach and it would have been way more fun to do it together. Besides, we had GoPros with us, they could get wet. The swimming experience was very cool. We walked from the beach and slowly made our way to deeper water. I didn't even realize the horses were swimming at first. 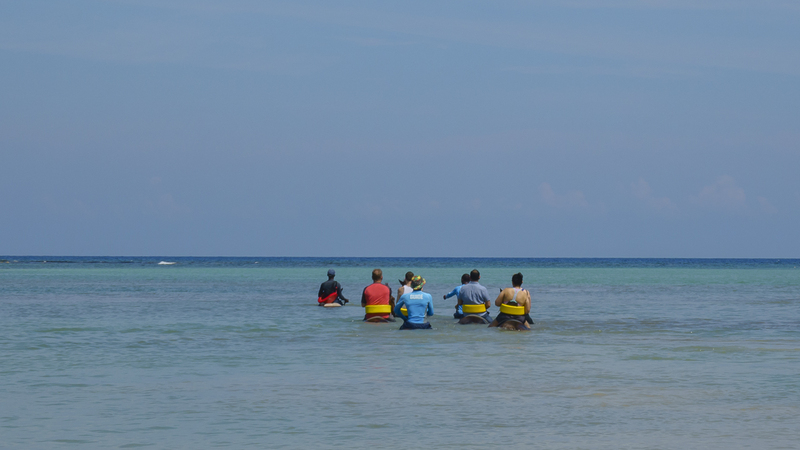 It wasn't until our guide said: "We're swimming!" That I noticed a change in the rhythm of the ride. We swam out in a large loop following our guides lead. There were three guides on horseback with us making sure all was well. 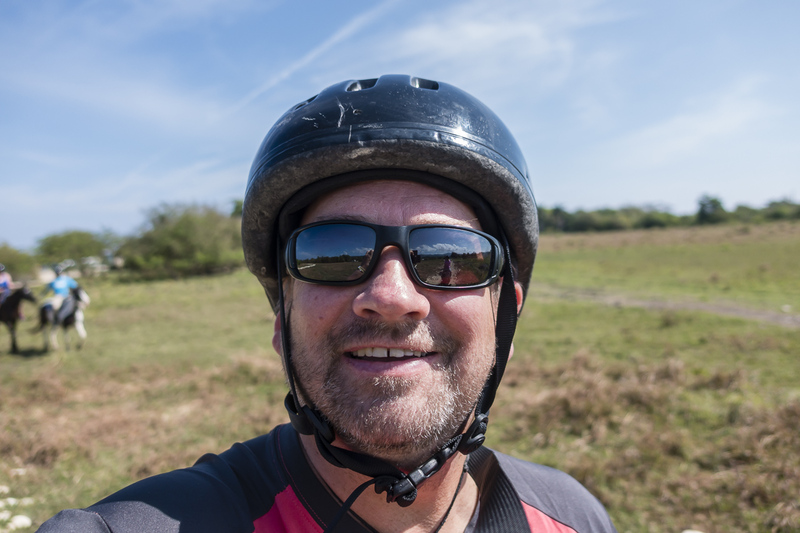 I ended up going off course a bit while taking some GoPro footage of the group and they had to corral me back. And that's when I made a little error. When our guide yelled "you're going the wrong way" I pulled on the reins to turn him towards the group. My horse reared a little bit and I fell off. The guide was quick to tell me to never pull on the reins when swimming. It pulls their head up and causes them to lose balance. Ah, lesson learned. My horse didn't seem to mind too much though. When I fell off, it kept on swimming as I scrambled to hold on to the light pad strapped to its back. Within a few seconds, we were back in formation and continued on with the swim. 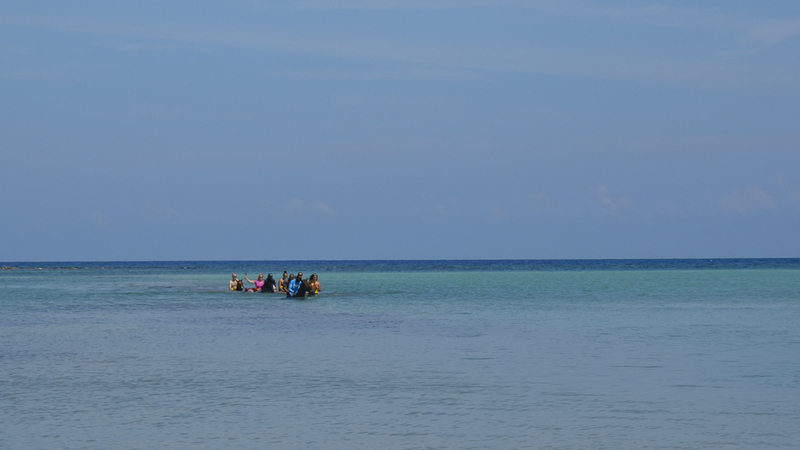 The swim switched between walking on sandbars and swimming in spurts. 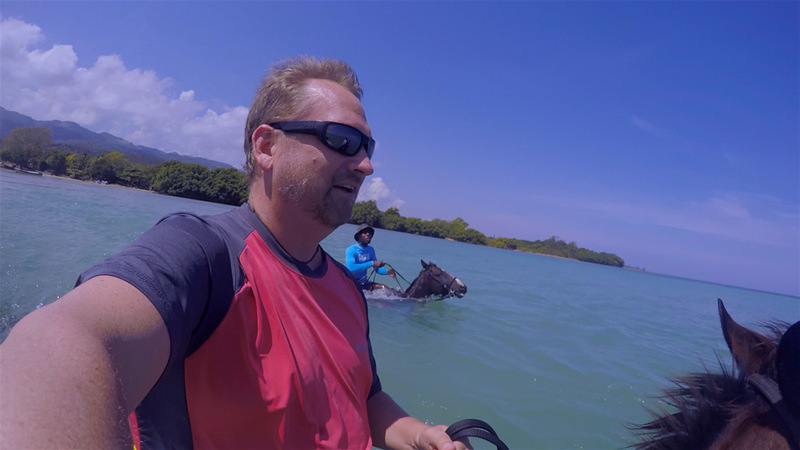 At first I was apprehensive about swimming with horses, but in the end, I had a great time. After seeing the horses swim in a calm and orderly fashion (even after a dummy like me fell off) I could see that they didn't mind. Hey, it's not a bad day when you get to hang out at the beach! The costs vary depending on the day package you are doing. But it is usually $79 for the ride and tour only. 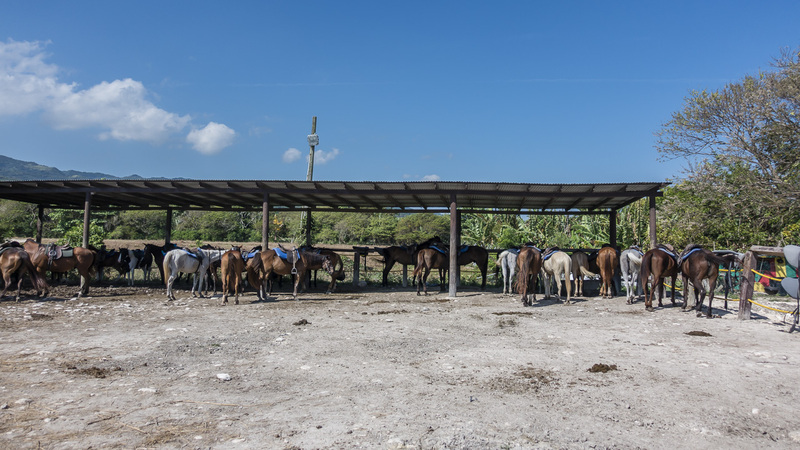 Horses used for trail rides in Jamaica are ex-polo horses that are now retired. I found the price of photographs to be too much. They charged $65 for a photo package. When are tour companies going to learn that if they make photos reasonable people will buy them? However, the photos on the beach were taken by the guides on your camera. We had them take our picture on our iPhone. So that's cool. The swim is 10 - 15 minutes. I have seen people complain about the short time and I cannot understand why they would complain. They do realize that the horses have to swim and work in the water. If they made it 30 minutes that would be really hard on the horses. In total, the experience lasted about two hours. We found it a good amount of time for the price. You can combine adventures and include zip lining, cliff jumping and ATving. For more information on Jamaica, visit the Jamaican Tourism website and follow them on social. Our trip to Jamaica is in partnership with the Jamaica Tourism Board, all thoughts and opinions are our own. Have you gone swimming with horses? Where? 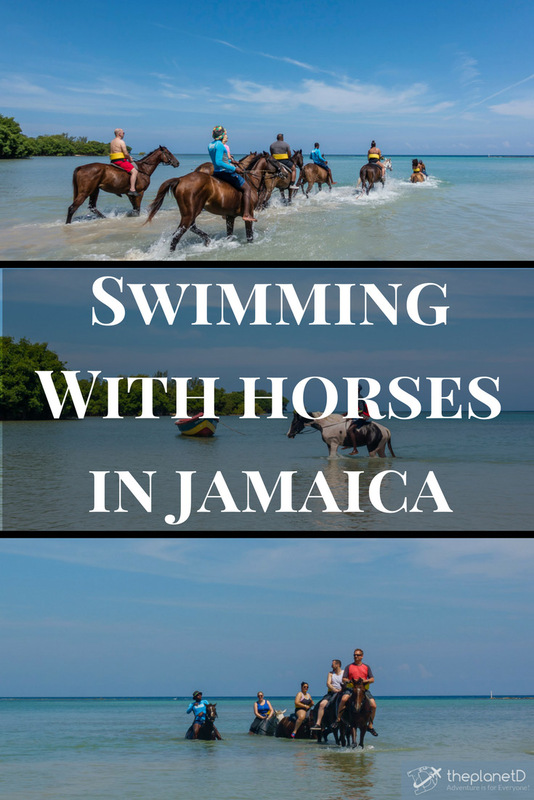 7 Responses to "Swimming with Horses in Jamaica"
It sounds quite interesting to swim along with Horse. I wish I could ride and swim. Thanks a lot for sharing this amazing post along with incredible photographs. 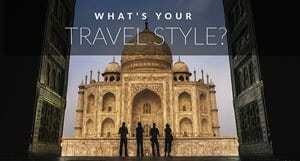 Hope that you enjoyed a lot in this exotic destination. Too much adventurous. Loved it. i’ve always wanted to try the swimming with the horses. It looks like fun. I’d worry about falling off too! This is very challenging, did not know that it was possible to swim with horses, I’m delighted. Looks like it is an amazing experience. Thanks for sharing your photos and great post. Fantastic! gonna try this for once for sure. Thanks for sharing.